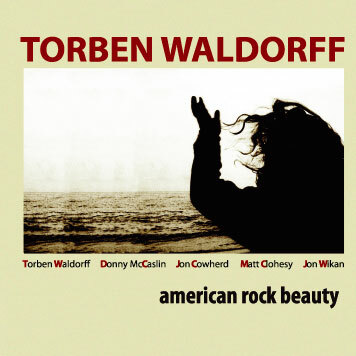 Capitalizing on the continued formula of a cohesive unit and compositions, centered not only around progressive musicianship but also melodic identity, American Rock Beauty further illuminates the dynamism of guitarist Torben Waldorff. Expanding on 2008's well-received Afterburn (ArtistShare), Waldorff confines himself to a stereotypical jazz idiom; his compositional ventures explore American rock, hard-hitting fusion, and poignant lyricism. His potent group continues to feature the pliant rhythm section of bassist Matt Clohesy), drummer Jon Wikan and formidable saxophonist Donny McCaslin, while also adding keyboardist Jon Cowherd, a member of Brian Blade Fellowship. Though edgy, the music is also earthy and accessible as it combines varying elements into a consistent theme. The jagged teeth of "Shark" literally cut a deep pocket as McCaslin starts and Waldorff follows with equal intensity. This is followed by "Shining Through," which oozes folksy small town humbleness as Cowherd's piano sings of gospel church and McCaslin delivers a memorable isolated closing solo. With deep empathy, the title song is superb. Its slowed tempo captures a vivid moment in time, each instrument's signature—echoing keyboard, coarse tenor voicing, delicate drumming, nuanced guitar strings and Clohesy's sweet bass spot—producing a relaxed excursion. McCaslin continues to show himself strong with an unrelenting statement on "Late" that moves into unison harmony with Waldorff, who concludes the matter with his own affirmative style. Their simpatico can't be understated; the success of this release is about band unanimity. A prime example is the peculiar "Lama ," which develops from beauty to beast with slow balladry and thumping trap work by Wikan. These moods celebrate life—the Brazilian painted "Song Ella" and the purity of both sadness and joy in "Scape"—as each takes its appropriate place in Waldorff's striking American Rock Beauty . "Torben has made a stellar recording. I just love it. It's a joy to listen to from beginning to end."